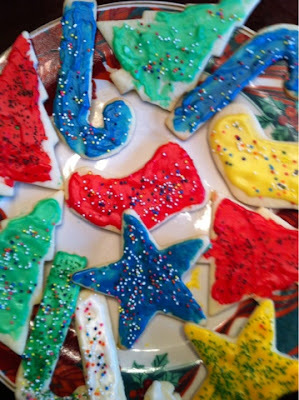 Today was the day that we made our first--but perhaps not the only?--batch of Christmas cookies. And that means making the dough, chilling the dough, making the icing, mixing the colors, cutting the shapes, baking the cookies, cooling the cookies, spreading the icing, shaking on the sprinkles, letting them all set . . .
. . . and then giving them away?